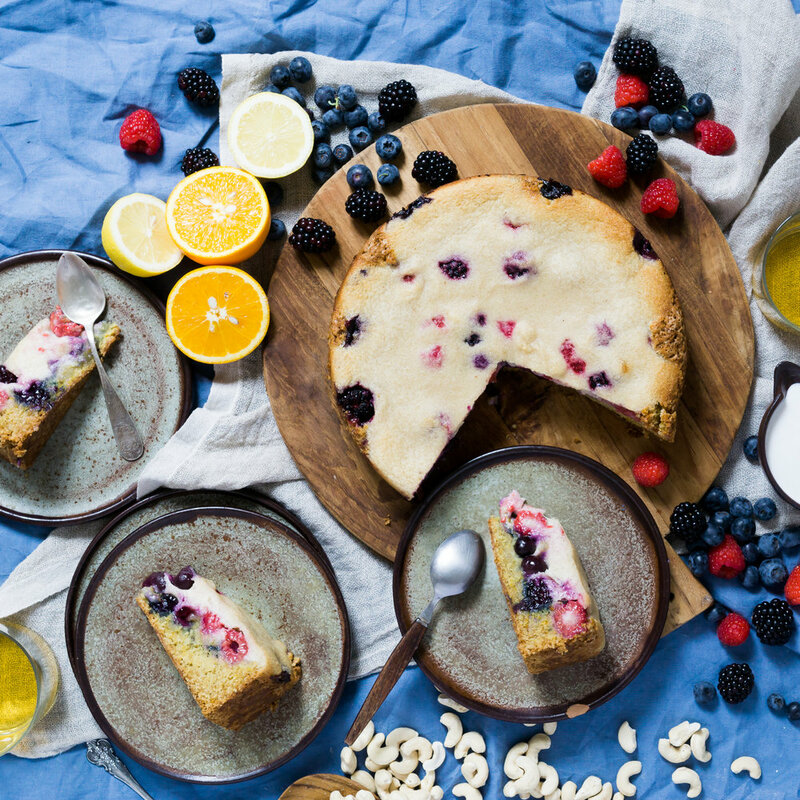 This is an old old recipe of my mums that I veganised when I first started my blog, turning it from a Berry Sour Cream Cake to a Berry Cashew Dream Cake. The original recipe is what got me my first job in Berlin - I found out that the cutest local cafe was looking for an addition to their kitchen and I went in with the (non vegan) version of this and a plate of Cookies and said 'Hire Me!'. The rest is history. - If your cashew cream is not already prepared, place cashews in a small pot with a lot of water. Bring this to a boil on a high heat, and allow to simmer for 15mins while you prepare the base. - Juice orange and pour into a measuring cup. You should have approximately 100ml of juice. Add enough coconut milk to bring the liquid up to 225ml, then add melted coconut oil. You should now have 300ml of liquid in total. Stir the liquids together with a fork. - Pour the liquids in with the dry ingredients, stir to combine and then pour into the springform tin. - Place in preheated oven and bake for 55mins, then allow to cool in pan. Once cool, store in the fridge until ready to eat. I have tried this cake in all temperatures, from straight out of the oven to out of the fridge. It definitely tastes best when cool.